Well located corner section batch with plenty of parking and room for the boat. Available for your use is a selection of reading material, dvd's, games, toys, skittle boards, boogie boards, small fishing rod, bait catcher,three kayaks (2 full size and 1 child size), a number of childrens life jackets and more. The children will love the beach and river which is great for kayaking, swimming, fishing or playing on the mudflats. 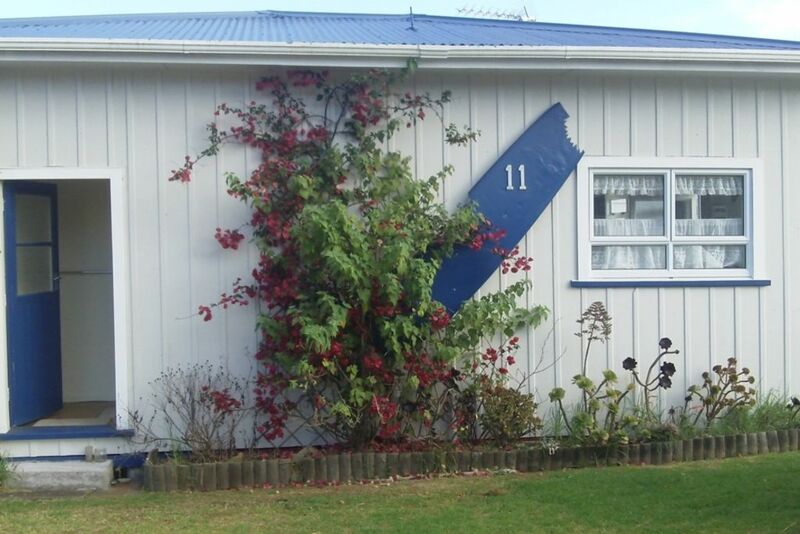 The golf course, beach, river, shop and playground are all within one minutes walk from the door. Very social and friendly community atmosphere throughout the camp, safe cycling for children and relaxing for mum and dad. Within easy 10 mins walk to the village which offers a small supermarket, cafe, hotel, hairdresser, petrol station, beauty salon. New Plymouth city is only a short 20 min drive away and the airport only 15 minutes. WiFi is available for purchase from the Urenui Hotspot. What a lovely Bach, it was well appointed with everything you need for a relaxing family beach break. We were actually attending a family funeral, so it was a lovely haven when we needed a break. Thank you!!!. Thank you, we enjoyed our stay. Great Bach for our family. Reminise of our family holiday when our children were little. Now they are sharing it with there children. Kayaks were great and even caught a flounder on the last night. The camp had slot of rabbits which could be a problem in the future but the 3 year old loved them coming out in the morning and night. Awesome place to stay, location was perfect! Beautiful Bach, highly recommended, had everything we needed plus more. Kids loved the use of the kayaks, toys, cards and goodies in the shed like the boards and bait catcher. Comfortable beds and good pressure shower is a must, so ticked all our boxes. Urenui is a great spot for kids, so much for them to do, we can't wait to come back yearly. Thanks again Narelle.